More than 1,000 public phone boxes - one in every five - will be shut by BT in Wales. Rural areas will be worst hit, with 40% of boxes in mid Wales likely to disappear. BT has blamed the explosion in mobile phone ownership, which it says has led to a "complete culture change in communication". But Brecon and Radnorshire MP Roger Williams said it was another example of second-class service in country areas. BT wants to reduce the 4,900 kiosks currently dotted around Wales by 1,013. It says it will still offer a payphone service, and subsidise nearly 900 kiosks which are making a loss. But Mr Williams, whose Powys constituents will lose almost half of their payphones, said he would be formally objecting. "This mass closure is typical of urban-centric organisations such as BT threatening rural services on purely commercial grounds," said the Liberal Democrat MP. 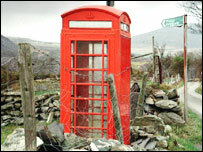 Ceredigion and Carmarthenshire will lose about a third of their phone boxes, and Gwynedd about a quarter. Graham Brown, Powys County Council portfolio holder for community service and chairman of the Community Safety Partnership said: "BT are assuming that everyone has access to a mobile phone or a landline and in many rural areas that is not the true. "In many cases the most vulnerable people in our rural communities, the elderly do not have use mobile phones. "Even where people do have a mobile phone the rural nature of Powys means that the reception is dependant on the network and is often unreliable and sporadic. "The move will only increase the perception of rural isolation and vulnerability," he said. BT said with the rise of mobiles, the number of calls made from its payphones had almost halved in the past three years, and revenue fell by more than 40 per cent. The company - which made more than £2bn profit last year - said only one in 100 homes across the UK did not have access to either a fixed line or a mobile phone. Paul Hendron, director of BT payphones, said: "We recognise that people in Wales may have concerns about our plans to reduce the number of payphones. "But I would like to reassure them that BT is still committed to the service, particularly for the communities who need us most." BT will manage the changes sensitively through extensive consultation, Mr Hendron said. Mr Williams said many of the communities affected had no mobile signal reception and often individual households had telephone faults which meant that the payphone was the only means of communication which is vital for emergencies. Tourism was of growing importance in the rural community and tourists value the availability of payphones in case of accidents and emergencies when their mobile is out of use, he said. "Surprisingly large numbers of rural dwellers do not have their own landline and depend on the payphone," said Mr Williams. "This is another example of rural people being threatened with second class services." BT is consulting with councils at all levels across Wales about plans to remove the payphones. It is also placing notices in the kiosks it has earmarked for closure.